Lotus, Perpetual Groove, John Brown's Body, U-Melt, The Breakfast, The Bridge and Toubab Krewe were worth the admission price. Rounding out the roster with some talented regional acts was the proverbial icing on the cake. The estimated head count was 2100 at the peak, counting the one-day ticketholders. Soles4Souls, a nonprofit that provides shoes for those in need, collected pile upon pile of new and used footwear from the generous attendees. There was also a benefit raffle with really cool prizes like paintings from Crazy Redbeard and Kamil Nawratil as well as CD's and t-shirts donated by the bands. 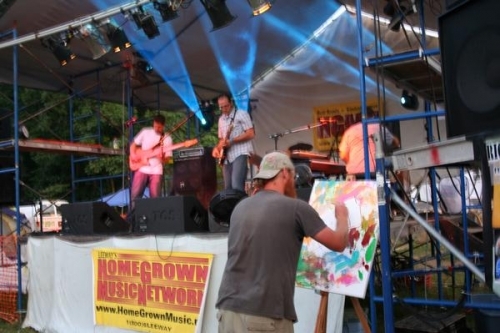 There were also Community and Band paintings awarded to the winners, in first-chosen-first-pick fashion. The Cove Campground is 3500 acres of dusty, bumpy trails that wind over and around shady hills and spring-fed lakes. Having one way in lead to a long wait in traffic for some of the patrons who tried to come in on Thursday, but from what I heard everyone made the most of it by getting to know the other folks in line. And, judging by how juiced-up everyone was when they made it in, there was a lot of partying on that dirt road. It was at least a mile from the main road to the checkin site/general store that overlooked the beach area, then another mile to the festival site. A fairly reliable shuttle packed people in and out and made continuous runs to the lake and the bath house. I can tell you, our trip to the lake on Saturday was a cleansing experience, physically, mentally and spiritually. I felt a pang of pity for the bands with afternoon sets. Everyone was asleep from raging all night or hiding in the shade to escape the heat. There were a few hoots and hollers from the Hill People (campers who were close to the concert field) whenever a band really rocked out, but the field stayed empty until sundown. There were a few technical issues throughout the weekend. Some sets were like on-the-fly sound checks that never ended. In protest, the Hackensaw Boys hopped offstage and played acoustic in the middle of the crowd. If you have that option as a band and they can't get the sound right, that seems like the way to go. Some of the bands stayed all weekend and had multiple sets. I didn't mind that until a couple of the band's played the exact same set. A word of advice - if you don't have enough songs, learn to jam. Particularly if you're an unknown regional band playing a festival that could expose your music to people from all over the country. My breakout favorite, Jazzam, could have played one more set and nobody would have complained. We had a lot of fun with some people who weren't able to handle whatever they had ingested. One sweaty fellow was on one of those "am I real, does any of this matter" trips and seasoned as I am at getting into someone else's reality and flipping the script, there was nothing we could do but have security take him somewhere to chill out. I could have probably indulged him a little longer if he hadn't made crude comments to my female friends and started his circular rants over from the beginning whenever I posed a question that blew whatever circuits were still firing in his brain. There was also the one-man drum circle that wouldn't end no matter how many times he was beseeched to do so. That was Thursday morning at 7 am when there were only a few vendors and staff on site and we were trying to get some sleep before the madness began. On the subject of madness U-Melt, known for their onstage antics, played to an impromptu wrestling match that fooled a lot of onlookers into believing it was all a set-up. I wasn't about to spoil their fun by telling them any different, but I'll tell you all now it was not planned. Another overindulgent fellow decided that he just HAD to be onstage, and Security was having a hard time convincing him otherwise. After the third time he started really fighting back and they pinned him down. He went over the barricade and a would-be vigilante in a gold cape swooped in and tackled him. They rolled around a bit, the cape flapping, then stood up and hugged, much to the confusion of everyone in the crowd. This is a study in perspectives. I talked to the stage dancer the next day and he barely remembered it. My friend saw it from backstage and said it looked like some cheesy flying effect from the 70's. The crowd didn't know what was going on. The vigilante believed he was helping Security protect the crowd. He found out later that they just wanted the guy away from the stage and had thrown him over the barricade. It all worked out for everyone. The crowd was entertained, the vigilante (I've seen that guy in the gold cape somewhere before - oh, yeah, in the mirror this morning) realized he should find out what's going on before flying in to the rescue, and the spun-out kid learned that if you don't play by the rules a gold-sequined superhero might take you out. You may have noticed by now I've abandoned my usual day-by-day show review format. If you want to know about the bands that played go to the Camp Barefoot website and look them up. Half of them you won't hear from again and the rest already have recordings of their shows from this festival posted somewhere in the ether. This was a you-shoulda'- been- there event and I'm not just saying that because Home Grown Music Network sponsored one of the main stages. Or just because I'm lazy and copping out on reviewing the bands. To tell the truth it's a little bit of all those things. After a summer of corporate-sponsored mega-fests an intentionally intimate affair like this is always a breath of fresh air, even if they did experience a few growing pains. This festival has a lot going for it and I hope they can keep it going while ironing out the bugs and keeping it small enough to manage. I am greatly appreciative of all their hard work and the VIP treatment we received. View a gallery of pro-photos at the Camp Barefoot Gallery.